Planning your first trip to Istanbul? How exciting! After two months living in the Turkish cultural capital I have knowledge enough to give all the tips you need to organize your holiday to Istanbul, Turkey. This is one of my favorite destinations, we already have been there four times, and every year that I put my feet there, feels like it´s my first time in Istanbul. Istanbul is a dream destination, it’s located in the edge of Europe where east meets west. Connecting the two continents, the city hides layers of history, culture, colors and scents. The architecture, the food, everything in Istanbul tells a story. The city is busy, fast, never stops, but when you need a break from all this fervid life there is always a nice garden, a small tea house or a mosque where you can seat, breath and relax. Many people have the idea that Turkey is not a friendly country due to the Muslim religion and culture. But the truth is: when you leave the prejudice behind you will be enchanted by the beauty of Turkey and its people. As much as you discover the city more you fell in love of Istanbul. For your first trip to Istanbul I would recommend at least five days, so you can have the taste of the ancient city and also enjoy the modern side of Istanbul. Although if you want to explore the big cities and the countryside, I´d say you should book a 10 days holiday minimum. In our last trip to Turkey we spent 60 days around the country and we didn’t have time to enjoy everything. Istanbul is huge, in 2013 there were 14 million people living there. The city is as big as any other European capital, however Turkey is a cheap destination if you compare with other countries. With a good travel planning I’m sure you’ll enjoy your first trip to Istanbul without emptying your pocket. Sounds good, isn’t it? Looking for the best areas to stay in Istanbul? Check out our guide! You can travel to Istanbul by bus, train, boat or flights, the best option will depend on where you are coming from. All the major budget airlines fly to Ataturk and Sabiha Airport, also Turkish Airlines has good connection from all around the world. Also check the flight fares on Skyscanner or Kiwi.com. If you are searching for some unique experience you can travel to Istanbul by train. The famous Orient Express Route doesn’t operate anymore, however you can use EURAIL PASS to get there from Europe and travel around Turkey by train. As you are travelling to a different country you always have to do a good research about visa and the documents you will need to cross the border. Last year Turkish government changed their visa policies, now many tourists that in the past had to apply for the visa at the Turkish Embassy can do it online in a really simple way. On the Turkish Visa Information website you can check all the rules, the fees and how to get your visa on arrival. Istanbul is full of hotels, hostels, guest houses and flats. From cheap accommodation to really pricey tags. Definitely you will need a professional help to find the best place for your taste and pocket. There are many helpful sites like First Choice that can make your life easy while booking a luxurious room or a budget hotel in Istanbul. Sometimes you can find affordable holidays packages to Istanbul, including flights and accommodation. The areas that are nice to stay are: Sultanahmet, Beyoglu and Taksim. All them are surrounded by restaurants, street food and are safe place to stay. As soon as you arrive in the city buy a Istanbul Card in one of the automatic machines. This card is accepted in all public transports even on the boats. Cheaper than the single journey ticket (jeton), you can top up the card with any amount of money you want. Most of the places and tourist attraction in Istanbul can be reached by public transport, especially by tram, metro, boats and funicular (buses can be a bit complicated to use there). But I would suggest you to walk as much as possible. Istanbul is an amazing city, with great architecture and hidden places. 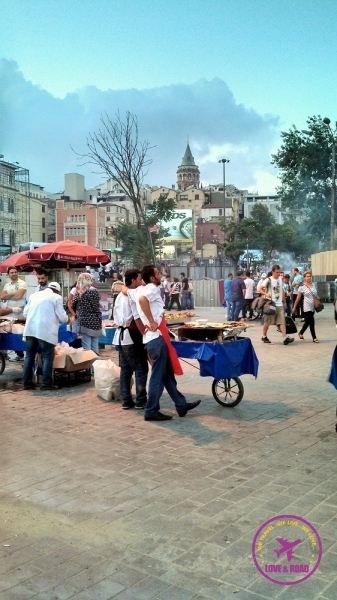 Exploring the city by foot is a unique opportunity to meet locals and enjoy the real Turkish feeling. Welcome to the paradise of food, sweets and teas. The streets of Istanbul are packed of kebab stalls, cozy restaurants, teas and coffee shops. There are so many flavors, spices, ingredients that Turkish food would deserve one entire and delicious blog post. Istanbul is beautiful and worth the visit any time of the year, but as the season changes the amount of tourists in city also varies. Spring and beginning of summer are my favorite time to be in there. I would definitely recommend you to do your first trip to Istanbul during May and June. In summer time be prepared for hot (really hot) temperatures, long days and amazing boat tours.When winter arrives it´s pretty cold and windy, but maybe you can be lucky enough to see some snow around there. And when it´s snowing Istanbul looks like a magical place. This year was the first time we got cold weather in Turkey (we were there in September and October), but we didn’t stay longer to wait for the snow season. For a big city Istanbul is quite safe. Maybe you can be surprised the amount of people begging on the streets, but most of the time they will not cause any harm to you. Because of the conflicts in the Middle East many refugees are living on Istanbul’s street. There is an area around Tarlabasi Street, close to the Taksim Square, that is known for being a place of drug dealers, prostitutes and danger. So please avoid that to go there especially during night time. As we are foreigner in a Muslim country, we should respect their traditions and habits. When you are enjoying the city there is no need to cover yourself or be worried about your clothes. However when you visit the mosques and religious sites please wear long skirts or trousers, also remember to cover your shoulders and chest. Now that you already got these precious advice it’s time to enjoy your first trip to Istanbul. If you didn’t buy your tickets yet, do it fast. If you already have your holiday booked, stay tuned for our next posts. I promise some nice and detailed information. Be prepared to learn my secrets about where to go, to eat, to party and to stay in Istanbul! Information I have being collection since my first trip to Istanbul. Are you planning your first trip to Istanbul? There are any other information you need to organize your holiday around there? Lovely post, Natalie. It looks a lot like parts of Dubai, from your pics. I’d love to visit Istanbul and immerse myself in its culture. Istanbul is an amazing city! Some of the architecture and religious places look alike Middle East, but far more relaxed and open mind. If you liked the article keep following our posts because there are lots of nice stuff from Turkey to come! Sadly people have created that perception that Muslim = dangerous and therefore attach stigma to many of the worlds most beautiful countries and their people. You are so right Chris, prejudice stops people of discover and learn about such amazing cultures. Hi Nat i am planning on visiting Istanbul in the coming months and i would greatly appreciate any insights or advice. All tips are on the above article. Do you have any specific question? Marta, If you have the opportunity to visit Istanbul, go for it! Great guide. I would also recommend sticking to the coast where the nice people are. As you travel further away from the sea, you will see the ugly face of Istanbul and Islamic conservatism. A common mistake though: Istanbul is not the capital of Turkey. Ankara is. Thanks for the heads up. We know about Ankara and even have friends that live there. It was a silly mistake already corrected. When I booked my flight to Istanbul I was so excited about this city, but unfortunately I couldn’t go for some reasons. I think I should book another flight, those pics are amazing! For sure! And if you need more tips, send us a msg! Istanbul is such an overwhelming and amazing city to experience. It’s great that you put together some suggestions on how to experience it when first visiting. Great ideas! Tks! We absolutely love Istanbul! Thanks for this, Rob! I am looking at hitchhiking Central Asia in two years and I am starting in Turkey. Istanbul looks very interesting! Really happy I read this! I will be visiting Istanbul in May and hadn’t even thought about getting a visa! We are big fans of Istanbul and Turkey, so if you need any info just send us an email! We have Brazilian Passport so we don’t need Visa to enter Turkey. Suggest to contact the Turkish embassy in your country. 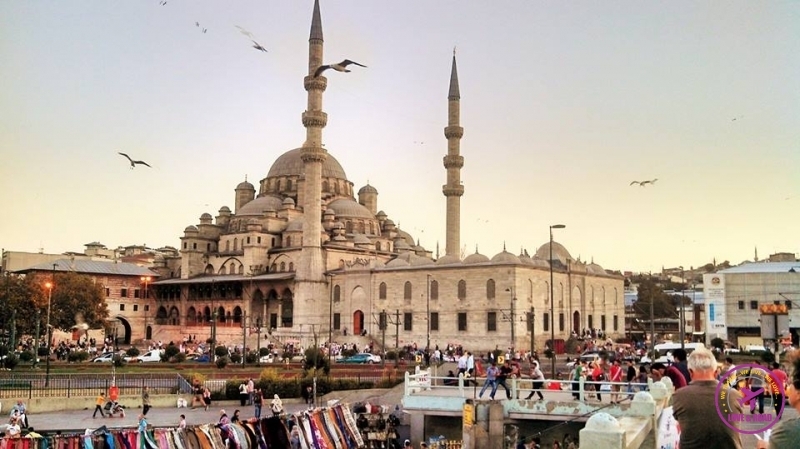 Great and useful article, I really enjoyed learning more about Istanbul. Especially on what to avoid. Thanks for sharing! I´m glad you liked the article! Natalie I love your blog! My boyfriend and I are traveling to Istanbul for the first time in October. It’s one of the places he’s always wanted to visit. I’m very excited to read through your other posts so we can plan our trip accordingly! We are so happy to help you plan your trip! I´m sure you will love Istanbul, is such an incredible city! If you need any more info let me know! Wish you two a wonderful trip! What a wonderful post. I visited Istanbul before and after an Intrepid tour of Turkey and absolutely loved it. I wandered around on my own and fell in love with the city. We have a love relationship with Istanbul too!! Wander around is the best way to find hidden places and get a real feeling of the city!! Tks for the tip Steve! I once visited Istanbul and one of my colleague advised me to try dondurma (Turkish ice cream). Its truly divine. I advise every traveler to try it. Its a unique delicacy. I enjoyed my trip a lot. Istanbul is a fascinating place to visit. Great list dear! Thanks for sharing this amazing post with us. Istanbul is one of most interesting, exotic, fantastic cities in the world. And don’t forget to add to that great Turkish food and the friendliest people. Istanbul is a magnificent city indeed… And the food OMG!!! Hi Natalie. Just embarking on first trip there! Starting with a friend I’ve been corresponding with. I enjoyed your post zone thanks. I saw this post on Twitter this morning, and have really enjoyed reading it. I was in Istanbul almost 2 years ago now, but absolutely loved it. I found the melting pot of East meets West mesmerising. Having been to Tangiers when I was around 18 (more than a couple of years ago now LOL) I was a bit wary of how Istanbul would be, in terms of my feeling of personal safety, especially as an obviously foreign female. But I was pleasantly surprised. So happy that you enjoyed reading the post. We LOVE Istanbul, as you said, it’s a melting pot of culture and people. I’m so happy to hear that you had a good experience there, I try to tell people to leave the prejudice and the fear aside and travel to Turkey and let this beautiful country surprise them too! All the best, happy travels! My husband and I will be in Istanbul for the 1st time for 4 nights and we want to check the historical sites of course and we are foodies too! We were thinking about staying near the galata tower, what do you think? Or do you think as the first time there the best bet would be sultanhamet? Well ,me and my boyfriend are planning for a trip for our honeymoon ,and we have January or February, So is that a good time ? And I heard some recent terror attacks last year , is it safe to go this year? January and February will be winter time, so be prepared with warm clothes. But it’s not so busy, so you get the chance to visit the attractions with a fewer people. About safety issues, it’s complicated to tell you if it will be safe or not. The whole Europe has been a mystery and you never know what might happen. But I try to leave my fear aside, I won’t stop traveling because of terrorism. I know this is a personal opinion, so you need to take the decision that best suits you. I hope nothing bad will happen as I’m planning to visit Istanbul again late this year. It’s a fantastic city and very beautiful, i love it! I was in Taksim Square and İstiklal Ave once! Yes, Istanbul is a fantastic city! This post is really helpful. I have my trip planned for 8 days this month. Although you have covered most the places to visit. Can you please throw some light on which beaches & bars are a must go? Also which restaurants? Did you also visit to Cappadocia for the Hot Air Baloon ride? Thanks for all your articles and pictures. I will be relying on your advise to visit some of the places during our 3 night-3 days stay. I and my wife are visiting Istanbul in the 1st week of February, which is going to be winter and expect it to be very cold. We are on our way to India and are taking 3 days’ break in IST, though it’s not a tourist season. Most of your pictures seem to be in summer time and therefore any advise on winter travel will be highly appreciated! Visiting Istanbul in February has 2 main pros & cons. Pack some warm clothes and enjoy the city! And drink more Çay to warm up! Me and my wife are visiting Istanbul in mid-May this year for our honeymoon for 3 nights & 3 days and from there we will catch the flight for Greece. We would like to stay at a hotel nearby Taksim Square. Would you like to recommend any places to visit and any other opinion for our short trip. Hi Natalia, I enjoyed reading ur post about Istanbul and I wish to come there during xmass period. Should I continue with the plans? Since we don’t have kids this is a question we can’t answer, sorry! Unfortunately, a lot of people do have this misconception about Islam. September is the start of the Autumn, the temperature will be between 16ºto 25ºC.